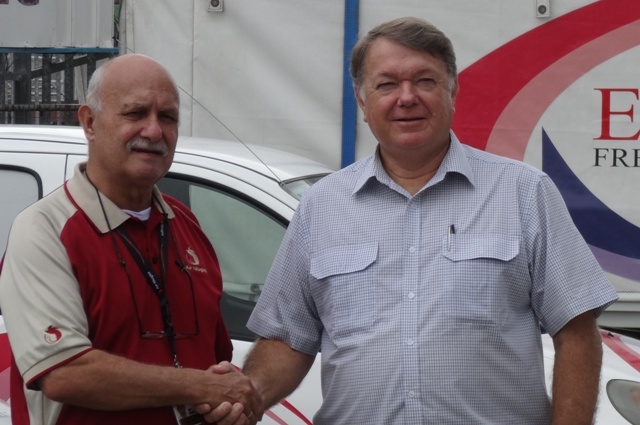 Air Niugini and Express Freight Management (EFM) have jointly announced a new initiative recently which allows for pick up and delivery of all Lae destined Cargo in Lae city instead of Nadzab airport. Under the agreement, both parties have indicated that from 01st September 2018, Air Niugini Cargo will be assisting businesses and the public of Morobe Province, mainly Lae City, with a split rates system using the current code of Lae to unload all Cargo at Nadzab (NZB) airport. These cargo will then be picked up by EFM and delivered to a designated point of collection in Lae city, which is EFM’s hardware house for customers to pick them. EFM’s Managing Director, Mr Robert Howden is pleased with this new initiative as it will ensure convenience for customers to pick up their cargo in Lae, instead of driving to Nadzab airport, which is about 45 minutes out of the city. Air Niugini Cargo’s General Manager Gus Kraus said it has been a long time since Lae was recognised as a destination by Air Niugini for Airfreight and this will change from the 1st September, allowing for deliveries to be made into Lae city and closer to the hub of all activities in the province. “ This will greatly assist businesses and the public as well as the government institutions and hopefully grow the Lae business market, while ensuring convenience also for the everyday person to pick up cargo or consign to Lae City instead of Nadzab airport.” Mr Kraus said. Naturally, there will be a slight increase to rates to allow for the transport cost for collection and drop-off between the airport and Lae City and vice versa but Air Niugini and EFM have agreed to keep this to a minimum, allowing for vehicle and manpower to collect and drop-off yet saving time/maintenance , wear and tear on all those that would otherwise need to collect their goods from the airport. The development of rates have been completed for both to Lae City and from Lae City and will roll out between Port Moresby and Lae initially from 01st September . It will commence with a review for a full country wide delivery/receipt of this new destination from all Air Niugini domestic airports to Lae City soon after.